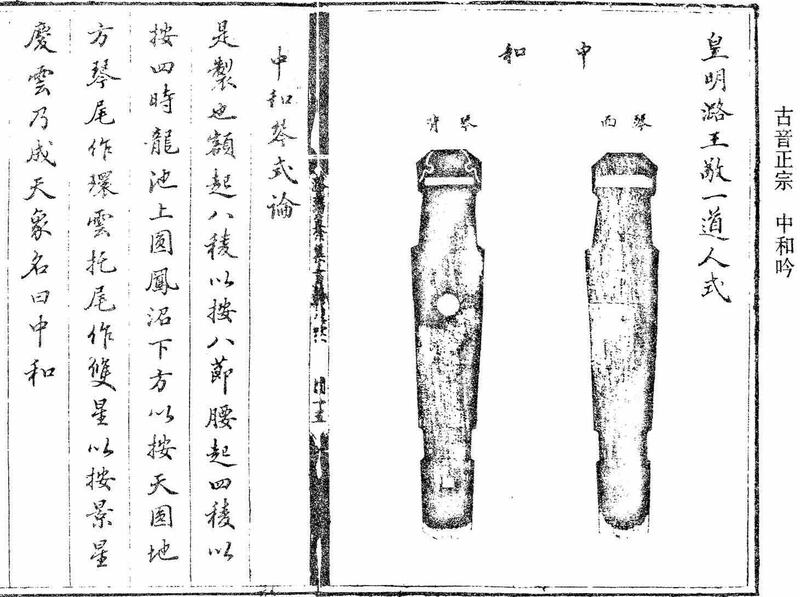 This handbook was compiled by (Prince) "The honor one-ness Taoist of Lu", Zhu Changfang, also famous for making qins.3 They generally have the same style as the one in the image at right. In 7 folios, this handbook has 50 melodies, 5 with lyrics. Although as a prince Zhu Changfang apparently had old tablature that might have been copied here, I have not yet found that any of the melodies here has an identical copy in an earlier handbook. At least 14 melodies have their earliest known printing here (search the Table of Contents for "earliest" and "only here"), with several of these being melodically unrelated versions of older titles. It is one of the first handbooks to use the new decimal system for some finger positions. It has the earliest tablature for Yan Luo Pingsha, a melody still popular today. It has the second earliest tablature for another melody popular today, the modern version of Ou Lu Wang Ji; the earliest was published in Sizhai Tang Qinpu, a handbook published in 1620 by the widow of another prince, who must have been a cousin. For "潞國敬一道人 The honor one-ness Taoist of Lu", 朱常淓 Zhu Changfang, see separate page.